As he looms triumphantly over a shattered Bat-Signal. this behemoth of brutality is impressive. imposing and downright awesome! Bane’s gargantuan physique has been captured in impressive detail.with his muscles. veins and sinews straining against his flesh as the Venom super-steroid courses through his body! From the scarring and wear on his steel-reinforced wrestling boots to the swollen and discolored flesh surrounding his nightmarish spinal implant. our Bane figure has been a true labor of love for our in-house team of artists and designers. The fine details and contrasting textures of the stitching and straps on his iconic Luchador mask. the shattered glass of the rusted and weather-damaged Bat-Signal. even the filth under Bane’s dirty fingernails - Every subtle nuance is true testament to how much time. effort and commitment was invested in bringing this Premium Format™ project to life! Standing 23” high. Bane is ready to strike fear into the citizens of Gotham and to conquer any adversary. 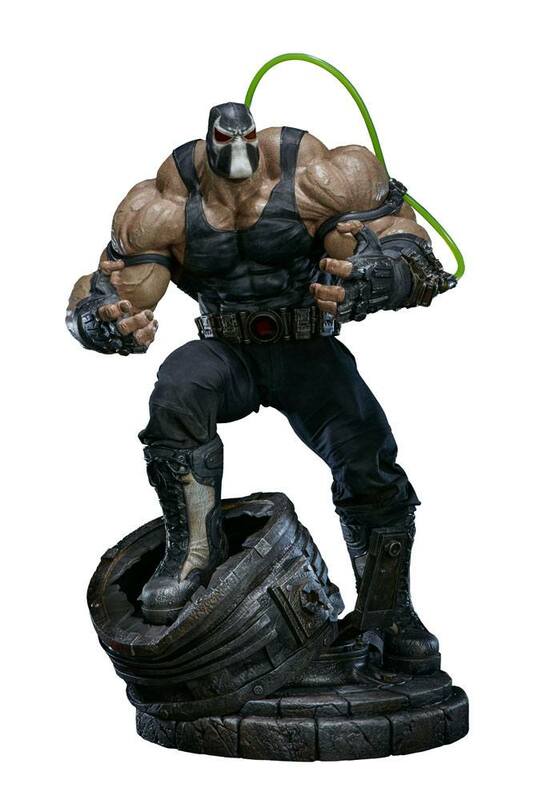 Our Bane Premium Format™ figure is must-have collector’s item for any DC Comics fan. and a proud addition to our ever-expanding line up of Batman’s rivals.